The members of Organization 13 were not only a set of some of the most villainous characters to be found in the Kingdom Hearts series, but by far some of the most interesting. Being a set of 13 individual “nobodies” each seeking knowledge, power, and hearts in an attempt to become a whole being or, for some, the ultimate being, it was intriguing to watch these Nobodies without hearts blossom into their fake personalities. However, there were some nobodies who were just that–nobodies. And then there were some nobodies who did everything but live up to that title. Starting from 1 to 13, including that 14th unofficial member, I’m going to analyze each Organization member’s relevance not just within the Organization, but within the Kingdom Hearts series as a whole. Also, I’ll explore the odds that we will be seeing their “somebodies” in the future. Demyx wasn’t really tuned in to the Organization’s plans or what was happening to Sora. He just wanted to be left alone with his sitar. How did somebody this lazy end up with a humanoid Nobody? What a disaster. I wish I could say something positive about the Organization’s 9th member, but I can’t. Demyx was clearly meant to be “the funny member,” but he came off as more annoying than anything. His laziness and his genuine lack of interest in anything to do with the Organization overall was so unattractive. Not to mention his lack of confidence in himself and his constant abandonment during 358/2 Days in the few missions he even joined us on were the things that irked me more than anything about this character. How can someone who contributes nothing need a vacation?! 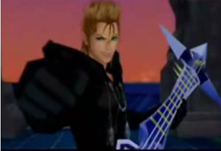 Recently voted in a site poll to be one of the fans’ least favorite members, Demyx’s lack of contribution to the Organization hurt his overall acceptance to the series. All he wanted to do was play that stupid Sitar, which ended up being a real pain when it came to his boss fight. Ten seconds to take out all those water sprouts wasn’t nice. The boss fight was literally the only moment where you can find any respect for the guy. At the same time, other than Axel, Demyx acted out and showed his emotions the most, attempting to hold on to the traits he had as a Somebody. In the novels, it is said that Demyx continues to do the things he used to do when he had a heart (like do his hair) and that he ignores Xaldin’s speech about keeping the noise down with his music and getting sleep to maintain his strength about the battles that lie ahead. Maybe he was in the Organization only to regain a heart, but he didn’t really want to be a member of the Organization because their line of work wasn’t his style. He even appears hurt when Sora says he doesn’t have a heart and can’t feel emotions. That is definitely something to pity him for, but pity won’t save him. End of story: he could have had a better role. I doubt we will see him again. It was true what he said–they really did send in the wrong guy! Luxord seemed like an okay character that ultimately wasn’t given a very strong storyline. It’s unlikely we’ll see him again, since Nomura didn’t care enough to give him much to do. Maybe he was included as preparation for a KH-themed Solitaire spin-off? As the tenth member of the Organization, Luxord unfortunately seemed more like game filler than a part of the series. To say that he fit in nowhere would be an understatement. He wasn’t needed at all. Was I the only one at the end of the game that forgot he had briefly appeared in Port Royal? He didn’t add mystery or humor. All he did was play games and banter on about luck. Well he wasn’t lucky enough to be seen as a useful Organization member, and nobody knows this better than Luxord himself. In 358/2 Days Luxord makes several comments of displeasure on being left out of the loop on important information, most notably finding out that Xion is a replica created by Vexen in an Organization meeting. However, it is after this same meeting that Luxord accepts the fact that he is a pawn in whatever game Xemnas is playing and continues to serve. But why keep playing the same hand, Luxord? It seems as though almost all of the other organization members had some type of secret game plan to overthrow Xemnas. He had a very good relationship with Axel. He could have joined in on Saix and Axel’s plans, as his quick way with words and gambler’s behavior could have found him a safe spot in their schemes. But, ultimately, he didn’t. He allowed himself to be treated like a chess piece in someone else’s game, all in exchange for information. For being such an intelligent and sophisticated Organization member, Luxord allowed himself to be played. There is no chance he will make a return as it is very apparent that his luck ran out in Kingdom Hearts 2. That’s all for this part IV of the Organization special! Check back in Wednesday, June 29th for part V and, more importantly–leave a comment! A normal resident on the KHU forums, Cloudy is a big fan of Final Fantasy 7 and its related games. Incidentally, she and her identical twin sister are both authors of this article and spend quite a bit of time discussing the intricacies of Kingdom Hearts (perhaps being twins helps them relate to Roxas and Ventus a litte deeper). With the bubble of ideas Cloudy and her sister has, readers can expect to see more of their work in the future.